One result of KTM‘s acquisition of Husqvarna is the crossover of models, with KTM motorcycles swapping orange for Swedish blue and yellow. 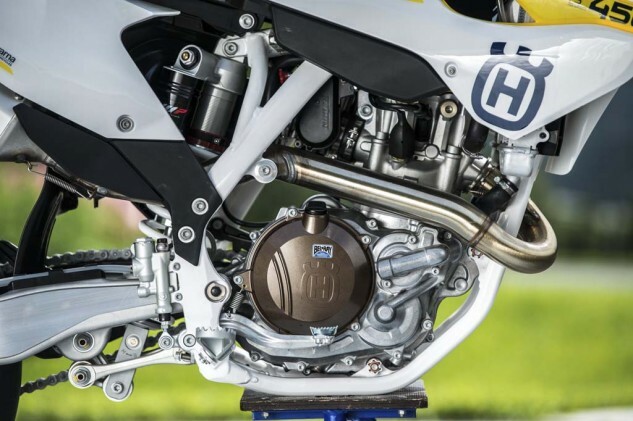 That is, more or less, what happened with Husaberg, so it’s no surprise to see that continue with Husky. 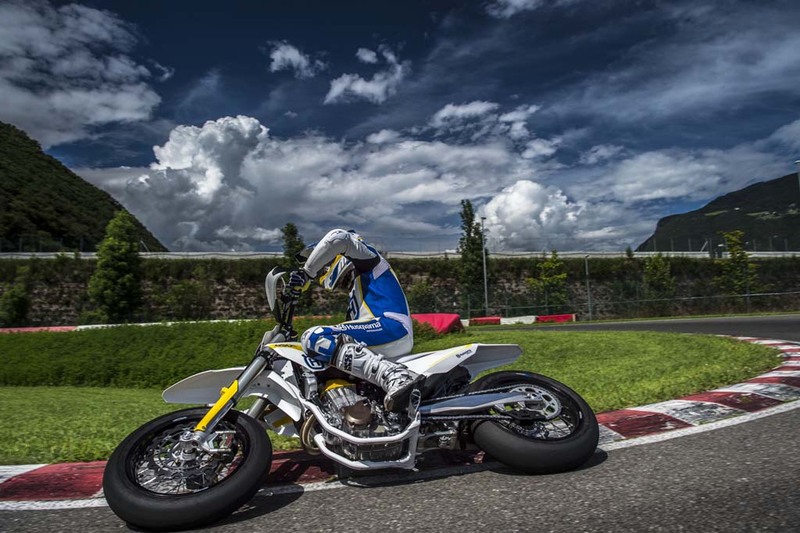 Another side-effect is we get to see more from KTM’s awesome photography department, as exemplified here with the press photos of the new 2015 Husqvarna FS 450 supermoto. 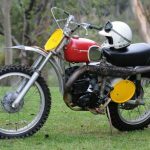 The FS 450 is essentially Husqvarna’s version of the KTM 450 SMR. 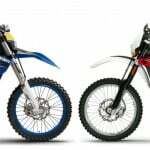 Both are based on 450 motocross bikes – the FC 450 from Husqvarna and the KTM 450 SX-F – so we can be sure the FS 450 is a proven product despite being “new”. Like the KTM, the FS 450 is powered by a water-cooled 449cc Single with four titanium valves actuated by a single overhead cam. Husqvarna claims a wide power band with a peak output of 60 hp from the engine. 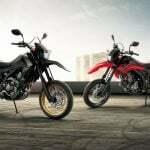 The FS 450 comes with an APTC slipper clutch to prevent rear-wheel instability during hard braking and promote supermoto-style drifting through corners. Power is delivered through a five-speed transmission. The chrome-moly steel tube frame is identical to that of the FC 450, promising precise longitudinal flex and optimized torsional rigidity. Up front is a 48mm WP closed-cartridge upside-down fork with adjustable rebound and compression damping offering 280mm of travel. WP also designed the rear monoshock with adjustable rebound and high/low speed compression and 292mm of travel. Brembo provides the four-piston radial-mount caliper gripping the 310mm front disc and single-piston caliper with 220mm rear disc brake. 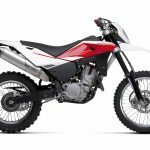 Other highlights include an easy-access airbox, Metzeler Racetec tires, 2-gallon fuel tank and a claimed weight (without fuel) of 243 pounds. 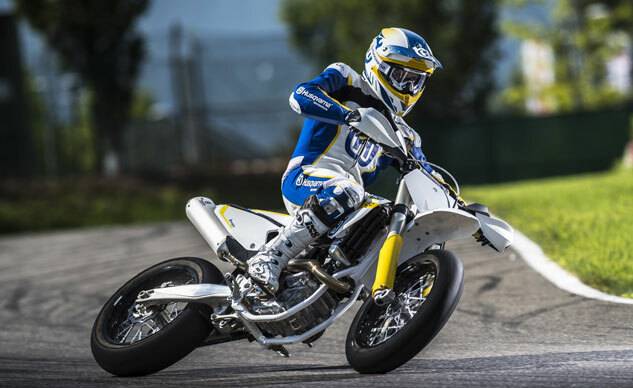 The 2015 Husqvarna FS 450 will be available in European dealerships in October, priced at €9,895 (US$12,810). 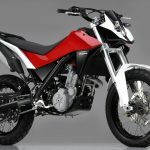 No word yet on whether we’ll see the FS 450 in the U.S., though the fact we don’t get the KTM 450 SMR doesn’t bode well.